The Space Aviary Convertible System can be closed to function as an enriched system or opened so that birds can freely roam about that barn. Access ramps are available to allow birds to climb between tiers. There are two drinker lines per tier and one flat chain feeding system inside the colony and is accessible that both sides. Each tier has two 140 mm (5.5″) wide egg belts. Optional dimmable LED light system in the corridors and inside the colonies. Optional tube for manure drying system. Models come in 2- and 3-tier configuration with option to stack up to six tiers. 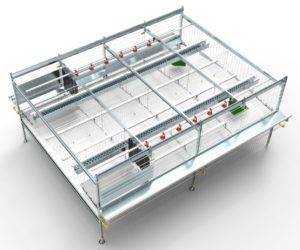 The VLV Aviary System give birds the freedom to climb, nest, perch and scratch both within the system and in the litter. There two drinking lines in front of the nest and one drinking line on the first floor. A flat chain feed system carries feed through the house. 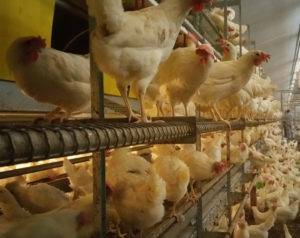 An automatic expeller moves the hens out of the nest at night. The nest can be disassembled by hand for easy inspection and cleaning. Available in double-decker configuration. Provides 44.78 sq. ft. of usable area for each meter of equipment. 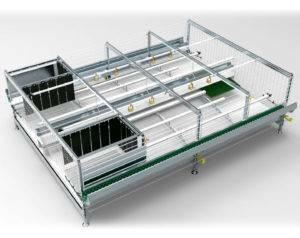 The Valli Space Colony is an enriched system featuring additional trough space in the colony to provide litter material to the scratch mats or accommodate extra feeding space for more hens per colony. Nests can be located at the front of the colony for shorter distance and improved cleanliness and shell quality, or can be located at the back on the colony, as is standard. The colony comes with a gentle and effective claw shortener, scratch mats, and ergonomic perches. 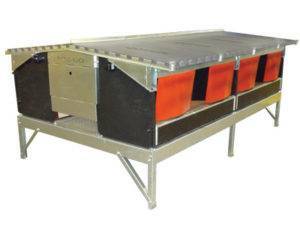 Main feeding system by traveling hopper or flat chain feeders. Up to 12 tiers with optional catwalks. The Freedom Flat-top Community Nest is designed for worker convenience and bird comfort. Perches line the top of the nest which allow the nest to meet UEP cage-free standards. Inside the nest, perforated mats enhance egg cleanliness, while providing a gentle but positive transfer to the egg belt. A gentle expeller prevents broody hens from staying in the nest too long. This new nest can be used for either a high-rise or a floor mounted installation. Available in center-belt configurations.